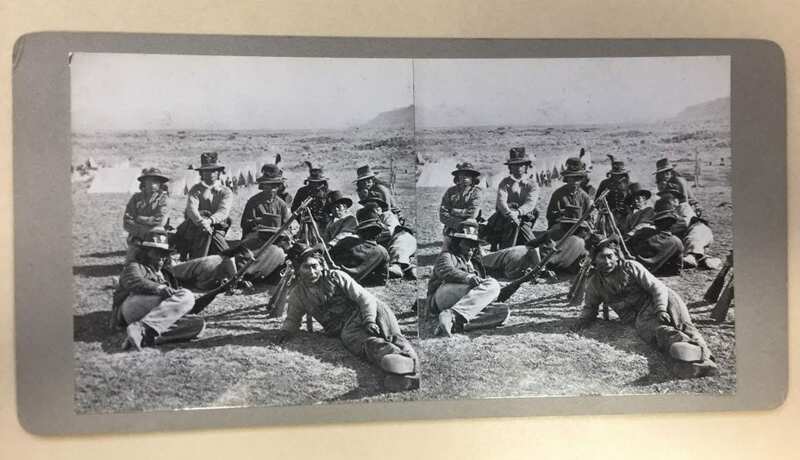 Special Collections and University Archives is pleased to announce a new finding aid published for the Muybridge photographs of the Modoc War (PH200_217). The finding aid is available on Archives West. Eadweard Muybridge (1830-1904) is most famous for his work of photographing a horse in motion, and settling the debate of whether or not a horse lifts all four feet off the ground while trotting. This collection documents the Modoc War of 1872–1873, from the perspective of the U.S. Army. Muybridge was commissioned by the United States Army to photograph the Modoc conflict taking place in Oregon and Northern California. The collection contains 15 stereoscopic photographs taken by Eadweard Muybridge. Muybridge photographed U.S. soldiers, Native American soldiers and warriors, U.S. Army encampments, and the battle field of the lava beds. One image that is especially interesting depicts a man injured in battle being brought back to camp on a kind of stretcher affixed to a donkey. This image displays the toll battle takes, the conditions it was being fought under, and the resources and technology available during the time. This collection forces one to consider America’s difficult past concerning the removal of Native Americans from their lands, as this practice is what drove the Modoc to fight in an attempt to stay on their home lands. The Modoc War was the only major Indian war to be fought in California. Given the scope of the war it was one of the costliest wars fought on U.S. soil. There were roughly 60 Modoc warriors, and at the height of the war the U.S. Army had 600 troops present. The casualty count at the end of the war was 15 Modoc warriors, only five of whom were killed in battle, 17 civilians, and 53 U.S. soldiers. The war was fought over lands in the Lost River area, where the Modoc had lived. The influx of white settlers caused the displacement of the Modoc people to the Klamath reservation. However, a history of strife between the Klamath tribes and the Modoc caused the Modoc to leave the reservation and return to the Lost River area demanding their own reservation there. As a result of the war the Modoc involved in the conflict were sent to the Quapaw Agency in Oklahoma, where many died from the harsh climate and disease. Some Modoc had stayed on the Klamath reservation during the Modoc wars, and they remained in the Oregon as a result of this. 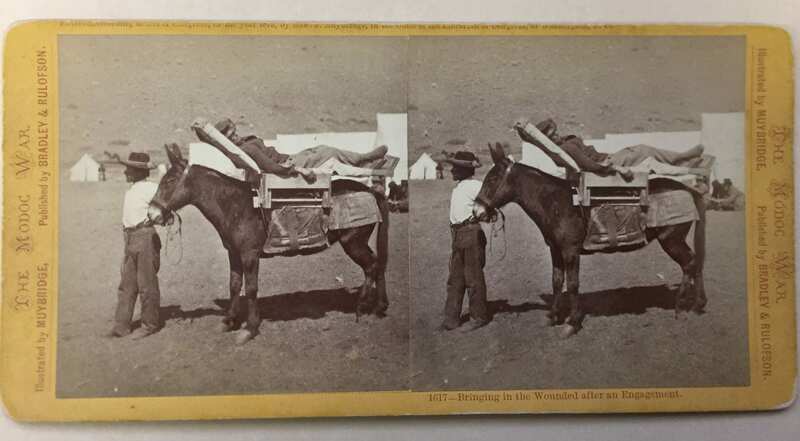 The Louis Heller photographs (PH200_038) also contain stereoscopic images relating to the Modoc War.